I have been waiting a while to dine at Brae, ever since we heard that Dan Hunter had upped stumps from the Royal Mail and shifted to the small town of Birregurra, near Lorne on the Great Ocean Road. And while I expected it to be excellent, I wasn’t prepared for how exceptional it would be – or that I’d get to use my fingers to eat. Since moving into the cottage vacated by George Biron of Sunnybrae in December, Dan and the team have opened up the series of rooms into one breezy dining space, with views into the immaculate kitchen. Dan’s front and centre, facing the diners, rolling out ribbons of pasta to order and eyeballing each dish as it leaves the pass. There’s only one menu option here: a multi-course marvel, which we’ve opted to enjoy with matching wines. The first clutch of seven dishes arrives at once, covering our table in small plates. There’s no cutlery at this stage; instead, we’re encouraged to eat by hand, adding a tactile layer to the experience. We work our way around the table, sipping a Blake’s Estate sparkling and Prickly Moses Farmhouse Ale as we go. Puffs of fried, compressed beef tendon come dusted with tangy mountain pepper. Fried slivers of orange and purple potato are flavoured with vinegar for a posh take on salt-and-vinegar chips. A herb-flecked wafer is smeared with housemade ricotta and figs. Sticky twigs of burnt pretzel are slathered in dark treacle and a fine dust of ground pork crackling. A perfectly turned turnip is topped with a crown of brook trout roe. 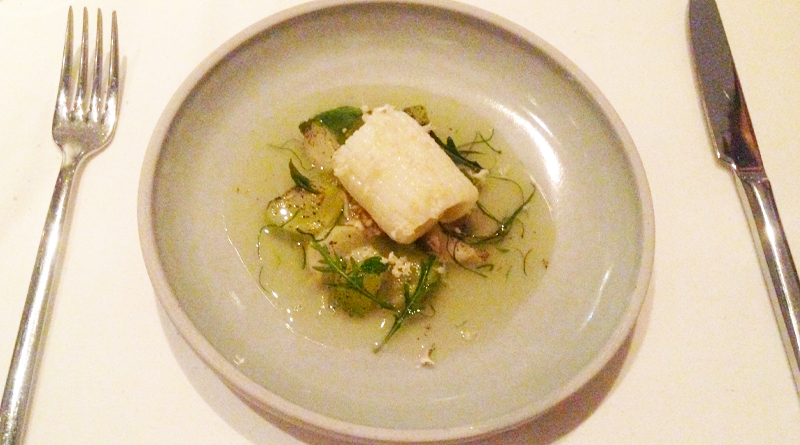 Zucchini encases poached eel and sea urchin for a delicate salty hit. And finally, there are the prawns, the meat wrapped in nasturtiums and flavoured with finger limes, the heads grilled whole and presented for sucking and crunching. And that, my friends, is just round one. Next up is a tender curl of calamari on a bed of sea succulents, lemon balm, wild rocket and other foraged greens. I’m all for its elegant simplicity, whereas Simon is left wanting more of a flavour hit. It’s pared with an ever-so-slightly off-dry Lethbridge Dr Nadeson riesling, taut with lime notes and a tight hint of sweetness. Tomatoes and uncommon leaves, lemon and mussel juice follows, a colourful jumble of heirloom tomatoes in a light mussel-scented broth. Here Gerald Ryan, the sommelier, shows that he’s no stickler for the rules, by cleverly partnering a Domaine Saint Nicolas Gamme en May. The gamay (the light red grape that is best known in Beaujoulais) is chilled to knock back some of the fruit-forwardness. We skip back to whites for the next course, with possibly my favourite Australian chardonnay, Bindi’s Composition from the Macedon Ranges. It marries perfectly with a tail of southern rock lobster with a carrot sauce and sea butter flavoured with dried and ground sea vegetables. The carrots and white onion add a soft sweetness to the dish. Then we’re back to eating with our fingers, this time swiping a warm, radicchio-wrapped cigar of raw wallaby and puffed wild rice through and earthy dollop of charred beetroot puree. It shines with the fruity Le Clos Perdus ‘Prioundo’ Grenache Carignan. Gerald is having fun by this point, pouring a ballsy yet bright orange wine, the 2006 Damijan Podversic ‘Kaplja’ from northern Italy, to match with wild pine mushrooms, milk curd, ground chicken livers and chicken broth. It’s a multi-textured, deeply flavoured assembly that leaves you wanting more. The final savoury course is the triumph. 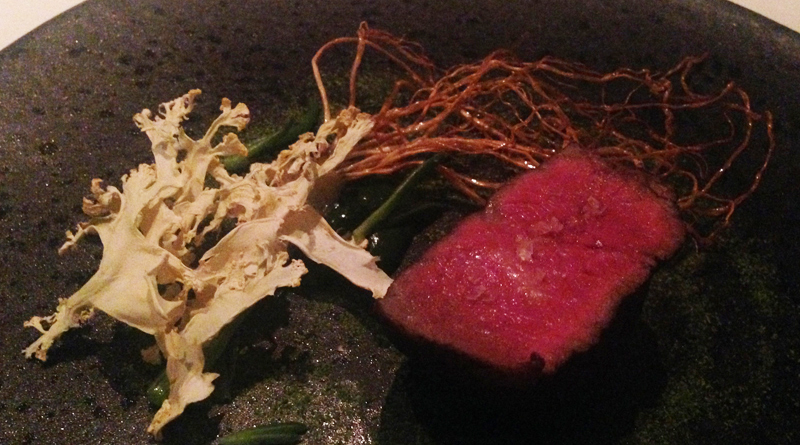 A tile of dry-aged Tajima beef, with wispy tendrils of crisp-fried leek roots, dehydrated cauliflower florets and a vivid green kale puree. It gets along famously with a Paradise IV Dardell Shiraz from nearby Geelong. Desserts kick off with a bowl of thumb-sized plums poached in caramelised onion liquor, with a rubble of honeycomb, candied lime rind and a quenelle of cultured milk sorbet, creating a delicate interplay between sweet, tangy and savoury. Already regarded as the restaurant’s signature dish, the parsnip and apple is presented as a horn of cornucopia, fashioned from a roast parsnip crisp and filled with parsnip cream and dehydrated apple, a process that intensifies the flavour and morphs the fruit into the feather-light texture of sherbet. 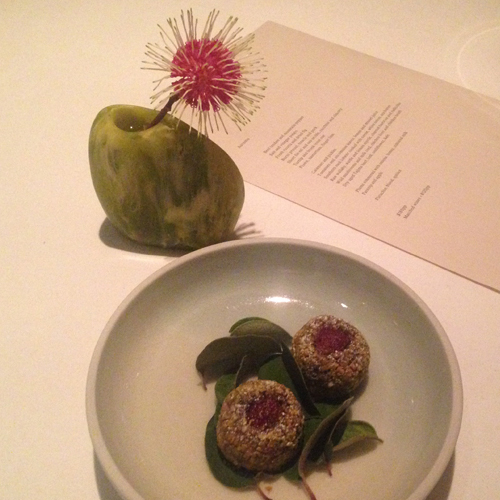 The last, perfect bite is a pair of pistachio and quince cookies, bound with pig’s blood in place of the traditional egg. 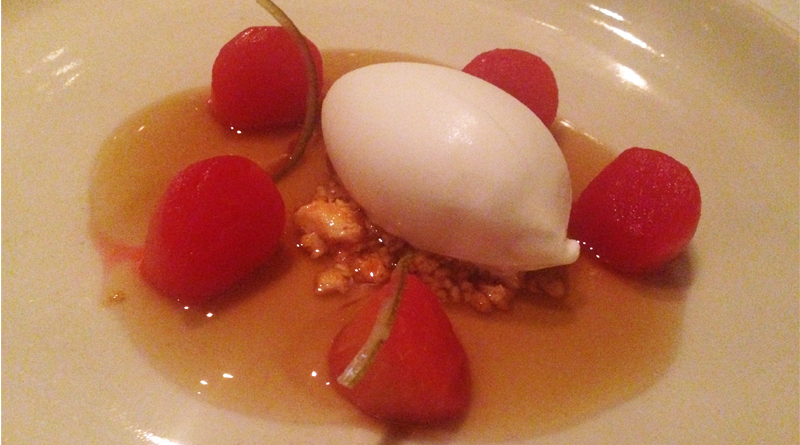 It’s an earthy, edgy send off to a sensational meal, one that already has us plotting a return for the summer months. Read my review of Dan’s time at the Royal Mail Hotel on Mr & Mrs Smith.